Marutham Castle is one of the residential development of Marutham Group, located at Pondicherry. It offers spacious and skillfully designed 2BHK and 3BHK apartments. The project is well equipped with all the amenities to facilitate the needs of the residents. In which area is Marutham Castle located?The project is situated in Saram, Pondicherry. 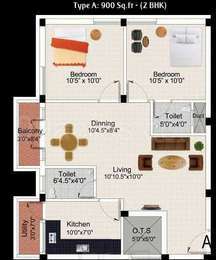 What apartment sizes are available in Marutham Castle? The project offers apartments sized between 885.0 sqft and 1235.0 sqft. How much is area of 2bhk in Marutham Castle? Two-room units (2BHK) in the project are available in an area of 885.0 sqft to 950.0 sqft. What is size of 3 bhk in Marutham Castle? 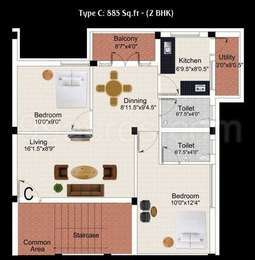 The area of 3 BHK apartments ranges from 1228.0 sqft to 1235.0 sqft. How many units are available in Marutham Castle?The project has a total of 9 units. Does Marutham Castle have kids play area? Yes the project has kids play area. ing quality and value for money that has made the builders make a mark in the realty market. The company has a mission to create affordable and comfortable living for its customers. It dreams build a brand name by constantly delivering nothing but the best.